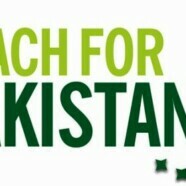 Teach for Pakistan invites applications for Teach for Pakistan Fellowship. Teach For Pakistan is a nationwide movement of graduates and young professionals who will commit two years to teach in under-resourced schools and go on to become lifelong leaders working across all fields to expand educational opportunity. An independent social enterprise, Teach For Pakistan, is a partner in the Teach for All global network of similar enterprises working to expand educational opportunity in 22 countries around the world. The Teach For Pakistan Fellowship is a full-time, paid position that is compatible with the pursuit of a broad range of personal and professional goals. This experience will allow participants to develop leadership and professional skills that are highly transferable from teaching to other fields including public policy, business, management and journalism. Throughout the two years, Fellows will be provided on-going teaching support as well as various networking and mentoring opportunities for professional and career development. The experience they gain is compatible with the pursuit of a broad range of personal and professional goals. Teach For Pakistan is holding an information session at FCC on 25 January 2012 at 2:00 pm. The venue for the session is E-25. Please attend this session to learn more about this exciting job opportunity. PS: Refreshments will be served after the presentation.